Wilmington’s surfing scene sparks creativity and, in turn, creates friendships. Just ask Chip Hemingway and Will Allison. Where Sea Meets Soul: Four North Carolina beach towns are among the best surf spots on the East Coast. Abundant waves, long beaches, and even longer summers set the scene, while local surfers — from all walks of life — bring the joy. On a sunny day, the ocean at Wrightsville Beach catches the light just so and shimmers an inviting aquamarine. The hue is different from the sea in other parts of the coast, the result of exceptional water quality and this island’s distance from rivers. Surf spots abound along the four-mile shoreline — from Mason’s Inlet at its northern tip, all the way down to the jetty on the southern end. The island’s north-south orientation and full exposure to currents make it a surfer’s dream. Will Allison, who has surfed Wrightsville Beach for nearly six decades, knows how to read this complex landscape, from the piers that collect sand and reshape waves to the inlet swells that shift when the channel is dredged for boat traffic. 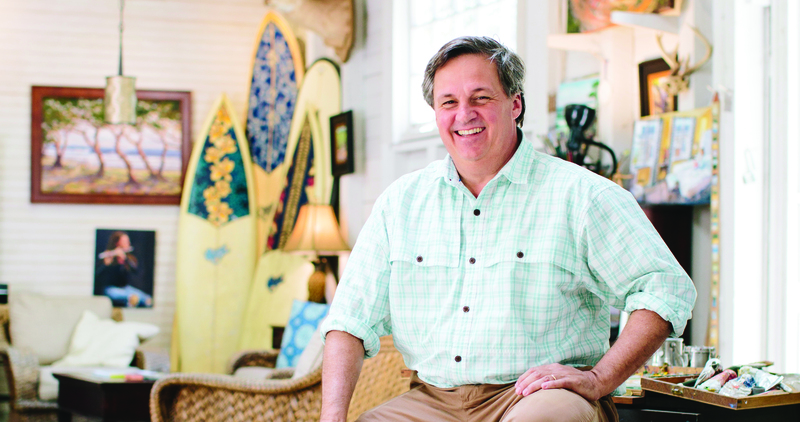 A surfer since age 13, and a graduate of UNC Wilmington, he also recalls a simpler time when the town was less popular. As a student with a part-time job, he could afford to live at the beach and surf his heart out. Not that he can blame anyone for wanting to live in the town he loves. A legendary board shaper, Will is a central figure in the town’s robust surf culture. You’ll see him teaching high schoolers how to shape boards for class projects, or you’ll find him at local breaks with white-haired buddies he’s been surfing with since the 1960s. Calling themselves the Wrightsville Originals, they reunite at beach parties — this town’s version of the neighborhood barbecue — to surf, eat, and swap stories. When Will shapes a board for a friend — and here, his friends are legion — he takes into account their body type and surfing style, as well as the kind of waves they ride. That’s how he crafted his friend Chip Hemingway’s favorite board: a nine-footer, now 20 years old — and dry for the past 10. It’s permanently on display in Chip’s work studio, beside several other Will Allison creations. Like all dedicated surfers, Chip is an amateur meteorologist. He and his fellow surfers track the storms that create waves and then roll on, causing the waves to dissipate. Just before that happens, offshore winds groom those waves to perfection, and that’s when surfers like Chip hit the water. On days like that, he cancels plans and hurries to the water’s edge like a kid on Christmas morning. The moment when his feet leave the sand, his belly hits his board, and he begins to glide through water, a giddiness comes over him and he laughs out loud. If he’s alone, he knows he’ll find friends in the lineup — people he’s ridden waves with for decades, some of whom he’s never once seen in street clothes and might not recognize on the sidewalk. When the sun or the waves disappear, Chip and his fellow weekday-warrior surfers pack it in. You’ll see boards poking out of their trucks as they drive down North Lumina Avenue. All they came for is written on a bumper sticker on a salt-rusted truck with a longboard in the back: Nothing a good day of surfing won’t cure. Spectators on Wrightsville Beach’s only wooden pier have the best seats in town to watch surfers catching waves. Originally built in 1939 over the hull of a Confederate blockade runner, the pier has weathered hurricanes and decay, with the ocean reclaiming much of the initial structure. A renovation in 2015 restored it to about half of its original 1,000-foot glory, ensuring that it will remain a grandstand for surfing for generations to come — and a free one, at that. Caffeine and surf supplies are in convenient proximity at SUNdays Café, housed above the brick storefront of the South End Surf Shop. Palm trees brush the windows, and brightly colored surfboards lean like dominoes on the wall out front. Spectators and surfers looking to beat the heat tramp over from Crystal Pier’s beach access to recharge and cool off. After a strong iced coffee, a sweet snack, and a look at the local surf art on the walls, you might want to venture out on a board, too. Krista Bremer is the associate publisher of The Sun magazine and author of A Tender Struggle: Story of a Marriage. She learned to surf in California.